Vorsteiner’s new kit for the M3 is actually the GTRS3 we’ve seen before, but this one is called the candy cane for obvious reasons! 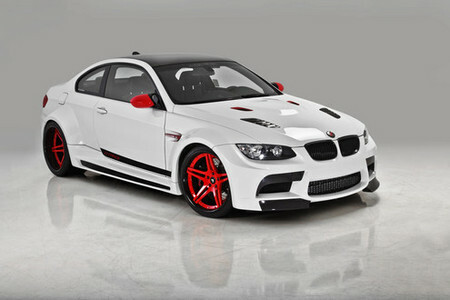 The Apline white M3 gets new red wheels, red accents, and red side mirror covers. That in combination with the massive aerokit and insanely wide arches make a superb looking car that is more suited for car shows and promo events than streets. The full kit’s ingredients include Vorsteiner GTRS3 Carbon Fiber Wide body Conversion,Vorsteiner Vented Carbon Fiber Race Hood,Vorsteiner VRS Carbon Fiber Boot Lid,Vorsteiner Lightweight Titanium Exhaust System,Vorsteiner V-309 Forged 5 Spoke Concave Centers 20×10.5J | 20×12J Wheels,Vorsteiner Red Piping Logo Embroidered Floor Mats,Michelin PS2 Sport Tires 285/25/20 325/25/20,Brembo GTR Big Brake Kit System Front and Rear, KW V3 EDC Coil over Suspension System, AA E9X M3 Supercharger 620hp Stage II.